Ridley Scott is one steely-eyed missile man. In recent years, the space genre has taken off with films like “Gravity” and “Interstellar.” When news first came out about “The Martian,” directed by Ridley Scott (“Alien”, “Blade Runner”) and starring Matt Damon and Jessica Chastain, there were plenty of jokes comparing the film to “Interstellar.” In reality, this film is no joke. “The Martian,” adapted by Drew Goddard from the novel by Andy Weir, tells the story of astronaut Mark Watney. During a Martian sandstorm, Watney, played by Matt Damon, is struck by debris, and the crew, thinking Watney died, leave Mars without him. The film follows Watney’s lonely struggle for survival on Mars and NASA’s relentless efforts to bring him home. It is difficult for a film about isolation and survival to be both fun and thrilling, but “The Martian” is exactly that. One of this film’s best elements is its sense of humor. For a story about an astronaut stranded alone on a planet with little hope of survival, “The Martian” is surprisingly light-hearted and funny. Despite his desperation, Watney is probably the most optimistic human in the solar system. Damon plays this character brilliantly, bringing a unique charm and humor to a realistically portrayed astronaut. With that said, the film is not all laughs. Early in the film, we experience pure Ridley Scott suspense as Watney needs to surgically pull shrapnel out of his body. “The Martian” is full of real terror and desperation. There are moments where we see that Watney is near his breaking point, and again, Damon plays the role to perfection. His portrayal of Mark Watney is his best performance in years. 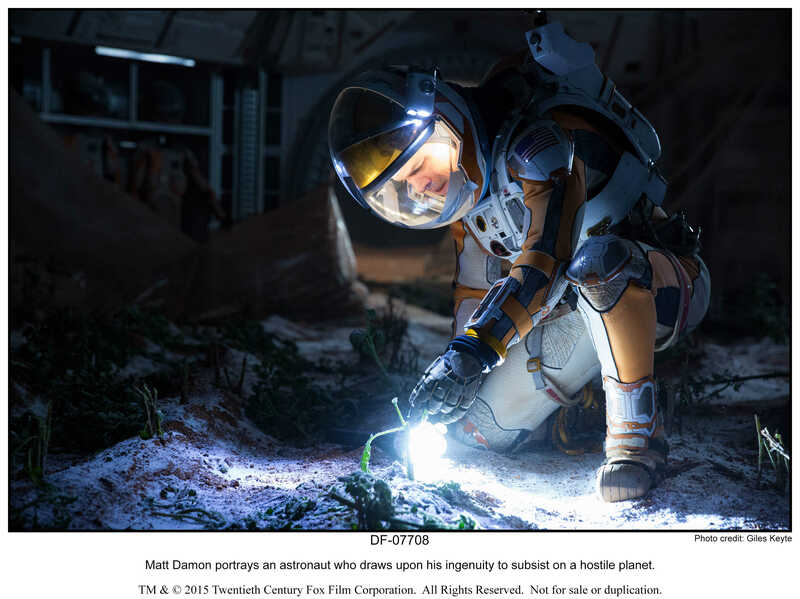 With “The Martian,” Scott shows his mastery as a visual storyteller. At times, you will need to remind yourself that the film was not actually filmed on Mars because Ridley Scott makes this obvious fact fade from your consciousness. Every mountain, crater and barren plane is convincingly Martian. The open landscapes of the Martian terrain are sublime and seeing Watney’s lone rover in a sea of red Martian sand impactfully conveys Watney’s isolation, contrasting the astronaut’s humor and optimism. The pacing of “The Martian” should also be praised. Despite its run time, the film neither seems to drag nor ever feel rushed despite the long chronology and complex narrative. This is largely due to the fact that the entirety of the film does not take place on Mars. The story cuts back and forth between Watney, the rest of his crew aboard the spaceship Hermes and the heads of NASA working on their plans to save Watney. The latter two elements are in fact very important and entertaining parts of the story, which makes “The Martian” more than a simple one-dimensional survival film. There was, however, a stretch of time which exclusively focused on the work of NASA back on earth. Although it was a fascinating part of the story, the film slightly lost focus during those scenes since Mars is the main setting of the film. Aside from director Ridley Scott, writer Drew Goddard deserves incredible praise. The film is not only very funny, but dramatic and visceral. The latter is a testament to the exceptional storytelling, as “The Martian” has no villain, just a series of realistic circumstances working against both Watney and NASA. Goddard’s script manages to perfectly balance humor and suspense while keeping the focus on the fascinating story. The attention to scientific accuracy also plays a large role in the film. Goddard has stated that he wanted the film to be a love letter to science. He wrote the script in such a way that, even for a science layman, the technical talk is easy to follow and the science of surviving on Mars is intriguing. “The Martian” was able to take all of its unique elements and combine them to form a fascinating film. Goddard and Scott created a film that blends the science-fiction and survival adventure genres and is beautiful to look at. The film succeeds because of its performances, sense of humor, smart writing and extraordinary visual filmmaking.